Okay, jokes aside, once again I do mean this in a fairly positive way. I’m not entirely sure what Chaos God led to me getting two of the weirdest surreal horrors on my list in a row, but both of them have honestly been pretty fun, so I can’t exactly complain. 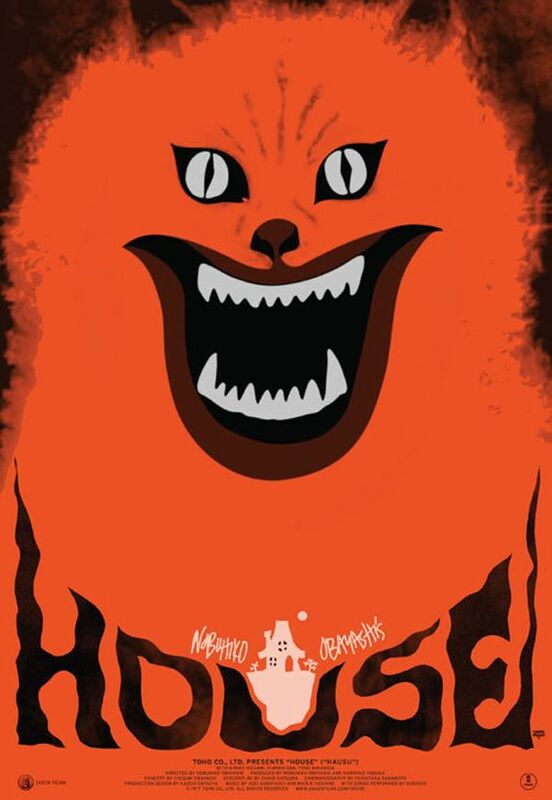 However, where Eraserhead was a masterclass of unsettling tension and oppressive atmosphere, Hausu is… silly. Really really silly. And weird and crazy and clearly not meant to be taken seriously. Hell, the main characters, a bunch of Japanese schoolgirls (because of course this comes from Japan) who are invited to a mysterious haunted house, are called Gorgeous, Prof, Kung Fu, Fantasy, Sweet, Melody and Mac (presumably after the Big Mac) and have the personality traits to match. This is clearly not intended to be a normal, serious movie and not only is that made clear from almost frame one, it doesn’t for a moment pretend otherwise. However, that doesn’t mean it’s not really enjoyable on its own merits. It’s absolutely chock-filled with great gory effects (and some which are terrible but enjoyably so), trippy visuals and crazy sequences and a girl being eaten by a piano. And then another being eaten by a lampshade. But not before her severed legs escape from said lampshade so they can launch a flying kick towards the… Okay, I think you get my point on why I think this movie is hella weird and silly. Like I said though, it is really fascinating to watch. Apparently the director got many of the ideas from his young daughter…. which makes a lot of sense if you watch the movie, but I really think it works in its own unique way. Like a story written by a young child, it has its strange leaps in narrative events and logic that, if you think about them make a twisted kind of sense, but not quite. Especially when you throw in the visual style and effects of Evil Dead 2 on top of all that. There aren’t really many movies, horror or otherwise, that I see willing to just go out and get as weird and crazy and silly as this movie. So yeah, in a lot of ways, in spite of both movies being fairly surrealist, this was really the polar opposite of Eraserhead. Yet, in its own unique way, I ended up really enjoying it. There were a few moments were it felt a bit slow and/or got a little too silly (or, more accurately, got silly in the wrong kind of way), but otherwise this was one hell of an amusing trip. Was is Scary? : There were actually a few neat horror effects here and there.